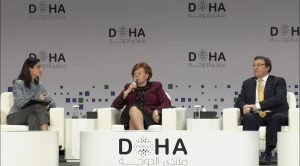 Dr. Vaira Vike-Freiberga, Former President of the Republic of Latvia (1999-2007) and current President of the World Leadership Alliance/Club De Madrid will be the Barrett Honors College Scholar-In-Residence during the Spring 2018 semester. Dr. Vike-Freiberga is a multi-faceted, extensively traveled and exceptionally involved global leader. She is well versed in international security and policy issues, Latvian heritage and music, and current events. She is also a member or patron of more than 30 international organizations. We caught up with Dr. Vike-Freiberga to get her thoughts on global leadership, politics and policy, the #MeToo movement, the importance of preserving heritage and culture, and her advice for Barrett students. Q: You are a member of the Global Leadership Foundation. One of the GLF’s current priorities is working with youth and sharing knowledge to support the development of the next generation. Why is it important for our students to connect with global leaders in government and industry? A: Many students like to see concrete applications for the abstract knowledge they are acquiring in their studies. Direct and personal contact with successful and experienced individuals from various walks of life allows them to hear about real-life challenges and the many different ways they can be overcome. Q: As a former Head of State of a European Union nation, what are the key challenges facing this long-lasting political and economic union of 28 countries, especially in the context of relations between the Baltic Countries and Russia? A: The EU has been going through a number of serious crises, starting with the 2008 financial meltdown and ending with the UK referendum to leave the Union, with the unexpected flood of refugees and illegal immigrants as well as repeated terrorist attacks in between. From a security point of view, the invasion and annexation of Crimea by the Russian Federation represents a serious breach of international treaties and memoranda, and Russia’s actions in the Donbas and Luhansk regions of Ukraine have created a new frozen conflict on the eastern borders of the EU. For Latvia, Estonia, Lithuania and Poland, the enhanced security measures taken by their NATO partners are a welcome sign of the strength of the Alliance and its commitment to Article 5. The presence of troops from a wide range of partner nations on their soil represents reassurance for the local populations as well as a serious deterrent to any potential aggressors. Q: Last year there were two significant developments affecting the European Union: Brexit and the election of Donald Trump to the presidency of the United States. With the rising trends of nationalism and populism, what is your opinion of this direction and its impact on the global community? A: The Brexit vote saddened all committed Europeanists and it remains to be seen just how happy it will make the citizens of the UK, once the negotiations with the EU are completed. The election of Mr. Trump as president of the USA was a shock to many and, no doubt a delight to all the media who made his name just about the most often repeated in the whole world. Mr. Trump’s isolationist tirades have given a lot of new material to TV and Internet comedians, but they have also had the paradoxical effect of making Europeans more aware of their need to close ranks and look after their own security and prosperity. Q: Noting your work with the Nizami Ganjavi International Center, how do we best confront issues of national security, while at the same time protecting the civil rights and liberties of our citizens and increasing the understanding of different races, ethnicities and cultures? A: The NGIC has been actively and vigorously engaged in promoting dialogue, tolerance and mutual understanding between people of different origins and persuasions, enlisting the support of current and past leaders in office, with the support of the president of Azerbaijan and local authorities. In the relatively short years since its foundation, it has achieved significant outreach to many regions of the world. Q: In April 2017, you participated in the Women’s International Forum. 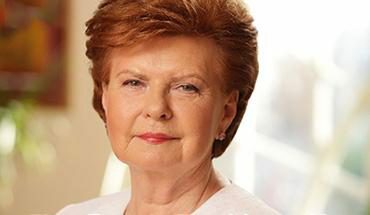 As a distinguished woman and former leader of Latvia, what are your thoughts about the #MeToo movement and whether this issue will lead to real change in the way women are treated in the workplace and their potential for attaining more leadership positions in government and industry? A: The past century has seen significant gains in gender equality in many parts of the world, but there are still a great many countries and cultures where women are considered inferior beings. The #MeToo movement has revealed that, even in countries where blatant sexism has long been considered outdated, appalling disrespect for women has been rampant among men with power over them, in the workplace as elsewhere. Unmasking such despicable villains is only the first step in discouraging others from feeling that they can afford to do anything with impunity. Q: On a related note, Oprah Winfrey gave a moving speech at this year’s Golden Globe Awards, which resulted in media speculation that she may run for president of the United States in 2020. Do you think Oprah would make a good candidate for our highest office? A: The speech was indeed very moving and consistent with the charisma and humanism of the speaker. I had the pleasure of meeting Oprah some years ago, at a dinner in Davos, Switzerland. At that time, she expressed admiration for the fact that I had a Ph.D. in psychology, as well as being a Head of State. She said she had never had other than honorary degrees. I told her that obviously, the lack of a higher degree had never stopped her: here she was, rich and famous without it, much more so than any psychologist with a string of letters after their name. Q: One of your key events while you are in-residence with Barrett relates to your expertise on Latvian folklore and identity. You are the author or editor of several books on Latvian culture. Why is it important for millennials to understand their own history and culture? What are the positive aspects of preserving a collective heritage for future generations? A: I have quite a long string of books and articles about traditional Latvian oral poetry, its structure, poetics and importance in the creation of a Latvian national consciousness in the 19th century. I have also spent many long years devoting part of my summer holidays to teaching young people of Latvian origin on many continents about the advantages conferred by having a sense of one’s roots and identity. People who feel comfortable in their own skins are the ones who have the ability to be tolerant and open toward others. Q: What are you most looking forward to during your time as a Scholar-In-Residence at Barrett, The Honors College? A: I always enjoy direct contact and interaction with people, and young people are a particular delight because they make one feel younger. Q: If you could give our students one key piece of advice as they pursue their academic goals at Barrett, what would it be? A: Strive for excellence in everything you do: if it is worth doing, then it is worth doing brilliantly. Q: What were your most memorable experiences as the President of Latvia? A: I am saving those for my memoirs! Q: Looking back on all of your world travels, what are some of your favorite destinations? A: My teenage years in Morocco have left me with a love of blue skies and sunshine, but swimming in a tropical lagoon remains one of my favorite occupations (too seldom enjoyed in recent years). Dr. Vike-Freiberga is the first Scholar-in-Residence under the Barrett Honors College Distinguished Global Leader Series, which focuses on building global engagement among honors students via personal interaction with world leaders. The Distinguished Global Leader Series is funded in part by a generous contribution from Craig and Barbara Barrett. Barrett Honors College is in the midst of Campaign 2020, an effort to gain support for programs like the Distinguished Global Leader Series and other opportunities that help students fulfill their goals and potential. Find out more about how you can join us in strengthening Barrett’s unique learning environment.